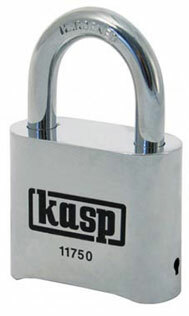 Next time you need a padlock get one you can trust, from Kasp®. Kasp® padlocks are manufactured to meet the most demanding security needs of domestic, commercial and industrial users, so when security really matters choose Kasp® - LOCKS YOU CAN TRUST! Kasp® padlocks are guaranteed to be strong, very strong, and to prove it we devised the ultimate test of strength and nerve as seen in our original TV commercial. To take a look click here. Not only are Kasp padlocks strong we are so confident in our product quality, that we offer a full 10 year guarantee against defects in manufacture and materials on all products. Browse our range to see how Kasp padlocks can keep you secure. Our easy to use Postcode finder will help you find your nearest KASP Security stockist. Click here and gain information on how to become a KASP reseller.